Sanitation workers demanding better wages were picked up by the police and threatened with being booked under the National Security Act. New Delhi: On Sunday, after taking a dip in the Ganga in Allahabad, Prime Minister Narendra Modi ‘honoured’ sanitation workers employed to keep the grounds, roads and toilets of the Kumbh mela area clean. He felicitated a few sanitation workers and washed their feet in the presence of TV crews. 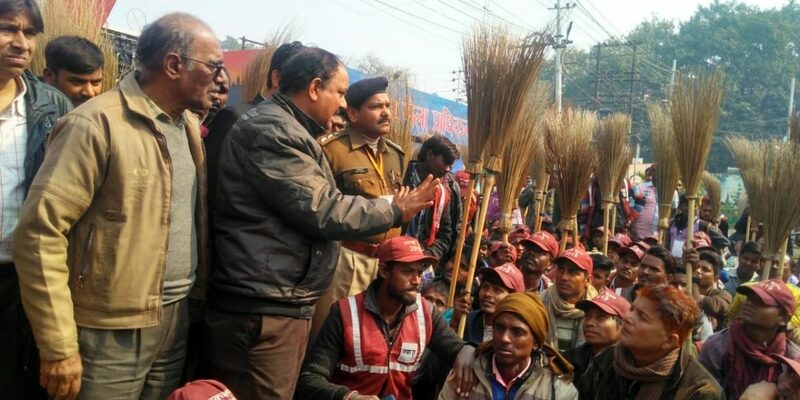 But leading up to Modi’s visit, the Uttar Pradesh police and administration in Allahabad displayed a starkly different attitude towards sanitation workers and their concerns. 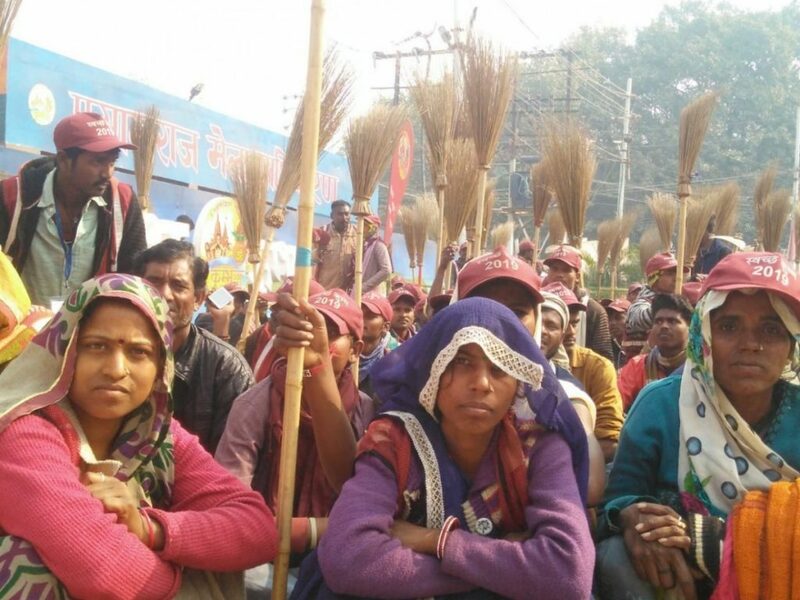 On February 7, two leaders of the Dalit Safai Mazdoor Sangathan were whisked away by the police in Allahabad. “A few policemen in plain clothes took us away without telling us why,” Anshu Malviya, a poet and one of the two people detained, told The Wire. According to Malviya and Dinesh (the other person who was detained), the duo were then taken to different police stations in the city. “We were told that we are engaged in anti-national activities and that the National Security Act would be applied against us,” said Dinesh, who is a sanitation worker. After six hours, when hundreds of workers gathered outside the police station, they were let off without any charge. What irked the local administration and the police was the activism of the Dalit Safai Mazdoor Sangathan, of which Dinesh and Malviya are a part. Since January, when the Kumbh mela began, the duo had organised several protests and written several letters to the administration. 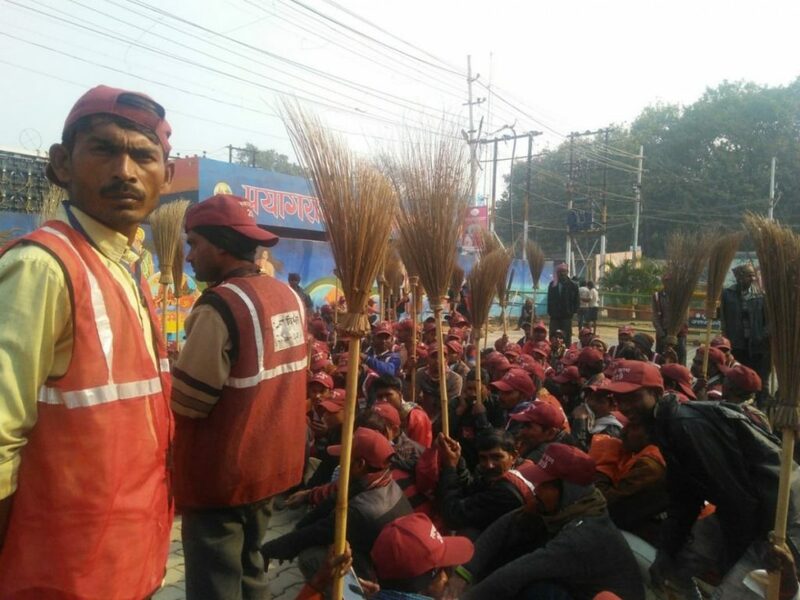 They demanded that sanitation workers contracted to clean streets, grounds and toilets in the Kumbh mela be provided higher daily wages, payment for overtime, better equipment, better facilities and insurance cover. “Our key demand was regarding wages. When the mela began, they were paying Rs 295 per day,” said Dinesh. After the protests led Dalit Safai Mazdoor Sangathan, the daily wage was increased by Rs 15, to Rs 310 per day. “The increase was nominal. But the workers were not even getting that amount. They continued to be paid Rs 295 per day and the rest of our demands were mostly overlooked,” said Dinesh. The protests continued. “In January, when we were staging a protest, we were called by the district administration. They told us that we are causing harm to the nation, that the Kumbh mela is a matter of national pride for India. By protesting, they said we are bringing disrepute to the nation and will be booked for sedition and under the National Security Act,” said Malviya. Many of the workers who have been employed in the Kumbh mela have been employed through agents spread across Uttar Pradesh, Bihar, Madhya Pradesh, Chhattisgarh, Rajasthan and Haryana. As the Indian Express‘s Somya Lakhani reported, many workers do not even know that they are being brought to the Kumbh mela to clean toilets. “No one told me I had to clean toilets. The thekedar said my husband and I would pick up the flowers devotees put in the river… I cried the first few days. I have never done this before,” 50-year-old Ghuriya said in the report. Dinesh told The Wire that the agents also promise high wages. “The agents just bring thousands of people from their villages, promising high wages. But, when they reach here, they realise what they have to do and that the wages they get are not what they were promised,” he said. The agents also pocked 10-20% of the wage as “commission”, Dinesh said. “The workers travel with their families because it is a three month mela. They do not have the option of going back also,” he said. 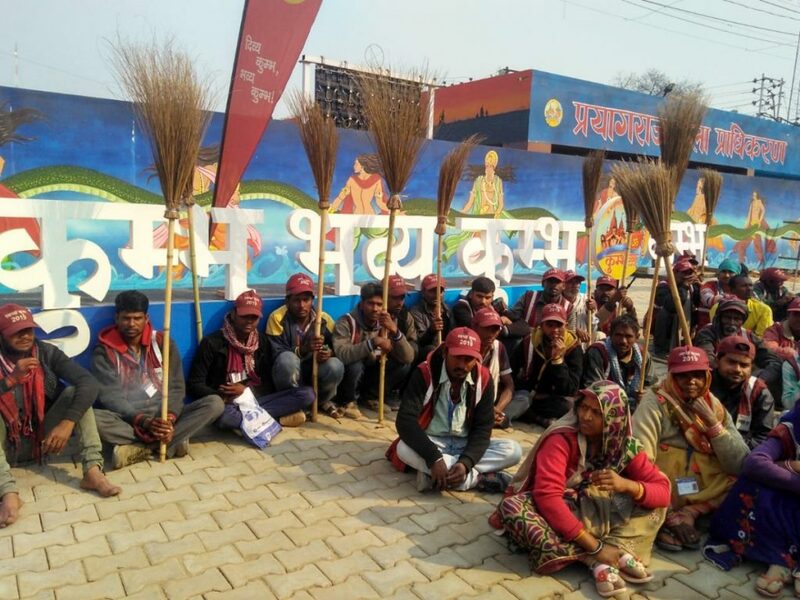 According to the Dalit Safai Mazdoor Sangathan, almost 14,000 sanitation workers have been brought in for the Kumbh mela. All of them are employed on a contractual daily wage basis. “In addition to the low wage, workers are also made to work more than 8 hours a day, sometimes for 14 hours. There is no payment for overtime,” said Dinesh. The administration has also not provided basic equipment such as boots, masks and gloves to a large majority. “Only about 1% of workers have received the basic equipment. We have continuously asked the administration, but to no avail,” said Malviya. The accommodation tents provided to the sanitation workers are often on marshy land. “Many people are put up on marshes, far away from where they are supposed to work. People come with their families and it also becomes an issue of safety,” Malviya said. According to government provided figures, 1,24,000 toilets are in place for the Kumbh mela. Each is connected to a plastic tank to collect human waste. “From the tanks, it is picked up by machines. But, workers are involved in connecting the machines and handling the tanks,” said Dinesh. On the days when the crowd is large, the toilets get blocked. The sanitation workers need to push the waste out, so that it is collected in the tanks. In this process, the workers come in contact with faeces and urine, Dinesh said. Vijay Kiran Anand, officer-in-charge of the Kumbh mela, however, dismissed the protests of the Dalit Safai Mazdoor Sangathan. “These people are not real sanitation workers. They just want to create trouble. That is why we took action against them,” Anand told The Wire. This entry was posted in Kumbh and tagged Caste, Politics, Rights.